We anticipate independent passengers with individual Russian Tourist Visas being able to disembark at approximately 9:30AM and therefore recommend that any independent services be arranged no earlier than this time. Passengers who have not purchased one of the available tours and do not possess an individual Russia Tourist Visa, or whose visa is not properly supported by the proper documentation, will not be permitted ashore in St. Petersburg. 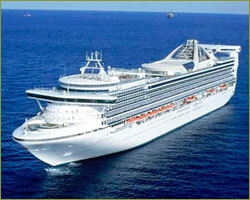 Visas cannot be issued during the cruise. In order to apply for a Russian visa, a guest must have a valid passport, which does not expire within 30 days of the last day of the cruise. We highly recommend that you pre-reserve you tours in advance due to limited space availability and documentation requirements. Participation on a liner's organised tour eliminates the need to obtain a individual Russian Tourist Visa and maximises your time in St. Petersburg. Please be advised that, at the time this tour booklet was prepared, we have been informed that Russian Customs and currency regulations may be subject to revision at any time. This could affect the type of currency necessary, the restrictions on items of purchase, the customs fees and enforcement, and other situations. Once on board the ship, you will be advised of the current regulations as we receive them from Russian officials. Often these regulations can also be at the discretion of the individual officials on duty, and their diligence may vary at any time. This tour booklet has been prepared with the most current information available at the time of printing regarding Russian visa regulations, policies, and requirements. Russia as a whole, however, is in an ongoing state of change. Vehicles with an English-speaking guide are offered on a half-day (four hours; morning or afternoon) or full-day (eight hours) basis. No deviations to duration, departure or return time can be made. This is a private arrangement; those accompanying you are the family or friends with whom you agree to share costs. Usually liners do not match groups of passengers to form a private group for the vehicle. Vehicles and guides are of extremely limited availability; reserve early. These are special tours designed to offer the privacy and flexibility of touring with family or friends and the convenience of sightseeing at your own pace. We also recommend private tours for non-ambulatory passengers. These tours are ordered per vehicle. One person in your party places the order for the vehicle; the entire cost of the vehicle is charged to that person's shipboard account and cannot be divided among the party. A tour ticket will be issued onboard the ship and delivered to the cabin of the person booking this tour on embarkation day. Once onboard the ship, you will receive a form requesting the names of each individual in your party. This information is required to allow your party to disembark the ship for the tour. Please provide this information promptly to avoid being denied to participate. Entrance, photography & video fees are included for the venues incorporated on your itinerary. Meals, refreshments and gratuities are not included. It is customary to invite the guide to dine with you, covering his/her meal expenses. Not only will the guide be able to assist you in ordering, but this will also provide you with a valuable opportunity to further discuss topics that might interest you. Your driver will provide his/her own meal and will remain with the vehicle. St. Petersburg is a large city with the same traffic problems found in other major metropolises. Take locations and travel time into account when planning your visit. We have compiled suggested itineraries to help you maximize your tour. Since these venues are likely to be visited by other tour groups, you may experience crowds at some locations. The information is a guideline to assist in your planning; information subject to change without notice due to conditions in Russia. Hermitage – Opens Tuesday to Saturday, 10:30am - 6:00pm; Sunday 10:30am - 5:00pm; closed Monday. St. Isaac's Cathedral – Opens Thursday to Tuesday, 11:00am - 6:00pm; closed Wednesday. Russian Museum – Opens Wednesday to Sunday, 10:00am - 5:00pm; Monday, 10:00am - 4:00pm; closed Tuesday. Peter and Paul Fortress – Opens Wednesday to Monday, 9:00am - 5:00pm; Tuesday, 9:00am - 4:00pm. St. Nicholas Church – Opens daily 6:00am - 7:00pm. Synagogue – Opens Sunday to Friday 9:00am - 6:00pm; services at 10:00am; closed Saturday. Cruiser Aurora – Opens 10:30am - 4:00pm; closed Monday and Friday. Peter's Log Cabin – Opens Wednesday to Monday, 10:00am - 5:00pm; closed Tuesday and the last Monday of the month. Peter's Summer Palace – Opens Wednesday to Monday, 10:00am - 4:30pm; closed Tuesday and the last Monday of the month. Menshikov Palace on the Neva – Opens Tuesday to Sunday, 10:30am - 4:30pm; closed Monday. Church of the Savior on the Spilled Blood – Opens Thursday to Monday, 11:00am - 6:00pm; closed Wednesday. Grand Palace in Peterhof – Opens Tuesday to Sunday, 10:30am - 5:00pm; closed Monday and the last Tuesday of the month. Chinese Palace – Opens Wednesday to Monday, 11:00am - 5:00pm; closed Tuesday and the last Monday of the month. Palace of Peter III – Opens Wednesday to Monday, 11:00am - 5:00pm; closed Tuesday and the last Monday of the month. Catherine Palace – Opens Wednesday to Monday, 10:00am - 5:00pm; closed Tuesday and the last Monday of the month. Do to expected delays in the afternoon, itineraries offering the Catherine Palace are only offered in the morning. Pavlovsk Palace – Opens Saturday to Thursday, 10:00am - 5:00pm; closed Friday and the last Monday of the month. Maximum capacity of each car is 3 passengers – maximum capacity requires 3 persons to sit in the back seat. Please be sure to request this tour by indicating the number of vehicles you wish to have – not the number of passengers. Private vehicle bookings are non-refundable after confirmation of the individuals making up your party. Actual vehicle type varies depending availability and number of passengers in your party. Increasing the duration or adding sites to your itinerary will result in additional fees. Video recording is restricted at Yusupov Palace.